View More In Shoe & Boot Trees. Are you tired of wearing old looking creased up boots? Would you like to find a way to keep them looking new for longer, and revive the look of your old ones? 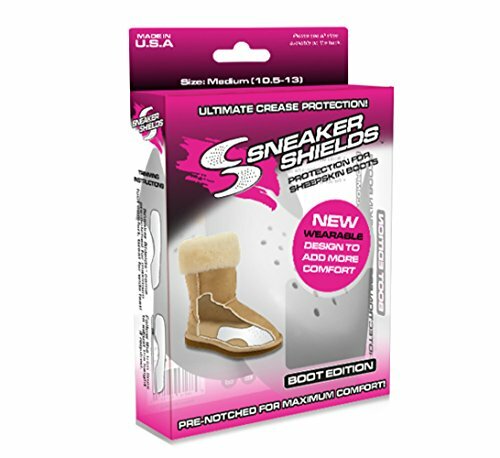 Look no further - Sneaker Shields is the perfect solution! The Boot is perfectly designed to keep your boots looking crease free. Unlike many others on the market, these can be used while wearing your shoes. They are designed to fit perfectly so that you barely notice that you have them on. It is specifically designed for Ugg's and similar winter boots. Perfect for any type of Sheepskin boot. It fits into almost boot without the need to be trimmed. It comes with an already pre-cut notch into the sidewall to allow space for your pinky toes. However, if you need to adjust them for whatever reason, they can be easily trimmed with a pair of household scissors. They come with trim lines making trimming super simple and easy. Sneaker Shields is a trusted brand and leader when it comes to keeping your boots looking new. Whether you want to wear your brand new Timberlands worry free, or repair your favorite pair of already worn shoes, Sneaker Shields is here to help! Perfect for storage, travel, or everyday wear. Order today and keep your shoes and sneakers looking new for longer. CREASE FREE BOOTS - Say goodbye to toebox creases on your favorite boots! Sneaker Shields were not only made to keep your brand new boots looking new, but to also restore your old looking boots. WEARABLE AND EASY TO USE - Perfectly fits inside most boots. Simply pop them in and keep them in while wearing your boots. Made with the perfect dimensions so you barely feel that they are even there! QUALITY - Made with durable yet flexible, washable, and non-absorbent materials. Unlike others, Sneaker Shields will last you a long time extending the life and appearance of your favorite sneakers. PERFECT FOR TRAVEL AND STORAGE - Stop stuffing socks in your boots when you store them or travel. Sneaker Shields are compact and act as the perfect crease guard for your boots when storing or traveling. TRUSTED BRAND - Sneaker Shields is a leader in the industry when it comes to keeping your sneakers and boots crease free. Just search the web for thousands of video testimonials and you will see what our customers have to say. If you have any questions about this product by Sneaker Shields, contact us by completing and submitting the form below. If you are looking for a specif part number, please include it with your message.